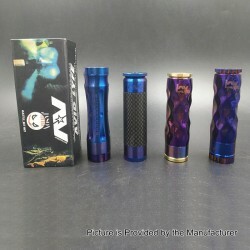 we just launched a new mod - AV Lyfe Dimple Hybrid Mech Mod Clone. Hope your guys like it. The AV Lyfe Dimple Hybrid Mechanical Mod Clone is constructed from aluminum (mod) and brass (top cap and button). The Dimple style mechanical mod is powered by 1 x 18650 battery (not included). Comes with the unique twisted shape, this mod will bring an amazing vaping experience to your vaping life!This item also has many material to choose.